How do I customize my Courses list as an instructor? 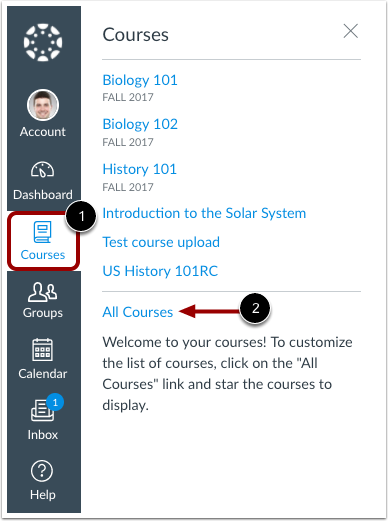 When you are enrolled in more than one Canvas course, you can customize the active courses you want to show in your Course list. Courses you want to show in the Courses drop-down menu are called favorite courses. You can favorite any published course that appears in the My Courses section on the course list page. Course favorites also display in the Card View Dashboard. When no courses are favorited, the courses list automatically displays up to 20 courses alphabetically in the drop-down menu. However, once you have selected at least one course as a favorite, only your favorite courses will appear in the Courses list. Note: Courses are always listed alphabetically; you cannot reorder your courses manually. In Global Navigation, click the Courses link , then click the All Courses link . To favorite a course, click the star next to a course . Courses with filled stars show the course is a favorite . In the Dashboard, any courses you have with an instructor role will be listed first, followed by TA roles and any other custom instructor-based roles. Your courses with student roles are listed last. After you have manually favorited at least one course, Canvas automatically favorites any new published course enrollments for you. You can only favorite active courses. Unpublished courses can be identified by using the Published column . You can favorite unpublished courses . Depending on course configuration, you may still be able to view your past enrollments after courses have concluded. However, favorited courses are not automatically removed as a favorite. If a past enrollment course still shows as a favorite, users can unfavorite the course by toggling the star icon. Previous Topic:How do I view my instructor groups in Canvas? Next Topic:How do I view my institution's Public Course Index as an instructor? Table of Contents > Global Navigation > How do I customize my Courses list as an instructor? Re: Is there a way to add tabs on the Dashboard?